Five Nights at Stampy's is an online game inspired by the game Five Night's at Freddy's by Scott Cawthon and the YouTuber Stampylongnose and the other members of the Magic Animal Club. It was created by a British teen with the aliases SilverGriffinflare, Lucythewerewolf, Death By Proxy and Cynder Rush. In 2014, He learnt about the game 'Five Nights at Freddy's', created by Scott Cawthon, that was becoming increasingly popular. 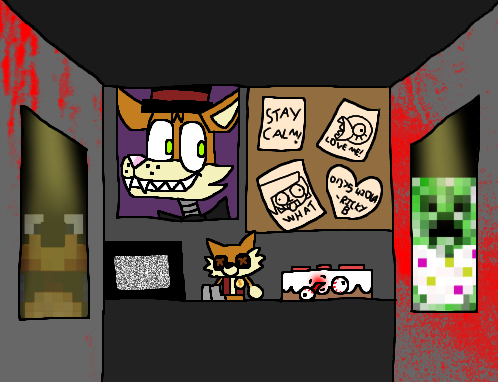 After creating a few works of fanart for the game, he had the idea of a crossover of Five Nights at Freddy's and the famous YouTuber Stampylongnose and his friends. He created some art based upon his crossover, however it was bad and he never posted it. Later, when he got better at art, he re-made the picture and posted it to DeviantArt. To his surprise, people actually liked the picture, and it even spawned a fangame, so he made a parody song about it and then later created his own version of the game using Scratch user Blaze_productions's coding. Now, he continues to update the game and draw art of it.